on iPad via iTunes or get it on your Android or Apple device through Zinio using this link. There is plenty that you're missing if you don't read AdNews in print (or the digital version, at least). 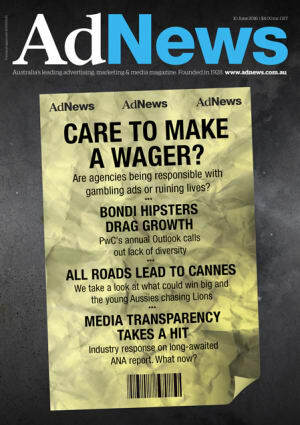 This issue, we take a look at gambling ads: are ad agencies being responsible or ruining lives? But that's not all. Agenda: Can Aussies kill it at the Lions? Yes we Cannes! See in advance what you're in for at France with our Cannes Preview, an overview of the best speakers and sessions, work that's in it to win it, and what jury members are on the look out for. "Cannes is probably the only awards show your mum knows. It's good to win a few so she thinks you're good at what you do" - Dave King, Innocean. Big Picture: Gambling in advertising is growing, but what lies in its wake? - "Agencies should always be cognisant of anything that impacts society negatively" - Lorraine Jokovic, Loud Communications. The Sell: The Bondi Hipster is out and about in the media and marketing industry. We look at why the demographic is dragging future growth and why growing business by expanding diversity is key. 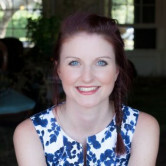 "We have to find growth because cost-cutting will only get you so far" - Megan Brownlow, PwC Media Outlook. Roundtable: Never before has the need to "think global and act local" been bigger. In partnership with Williams Lea Tag, AdNews hosted a roundtable with the biggest brand marketers in the country to find out how they navigate these dual interests. "“The tyranny of distance actually works in our favour; we can fly some stuff under the radar and take some more risks" - Tamara Howe, Kellogg. Plus all the regular opinions, Off-Brief and more. Read the print edition of AdNews out today. As well as in-print you can also read it on iPad via iTunes or get it on your Android or Apple device through Zinio using this link.